Check out what's new with Beta Xi by visiting our Historian on Facebook! 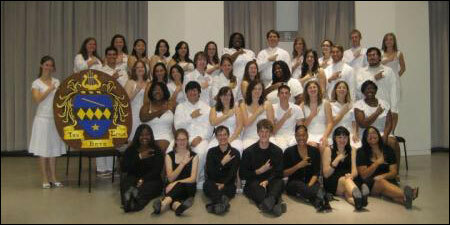 Congratulations to our New New Sisters of Spring 2011, Xanadu Pineapple! Be sure to Keep up with our Chapter's activities on our Facebook page! Also, awesome paddles from eons ago. Hannah and I are working on photocopying all the band pictures and the TBS pages, as well as KKY, PMA & SAI, from past yearbooks that the Band Office has. We are doing this so that we can have on record our past. We are meeting Mondays, Wednesdays, & Fridays from 9:30 am til about 11:30am. Any help is welcomed and appreciated!! Congratulations to the Sisters of Fall 2010! Welcome Fall '10, Midnight Shenanigans.